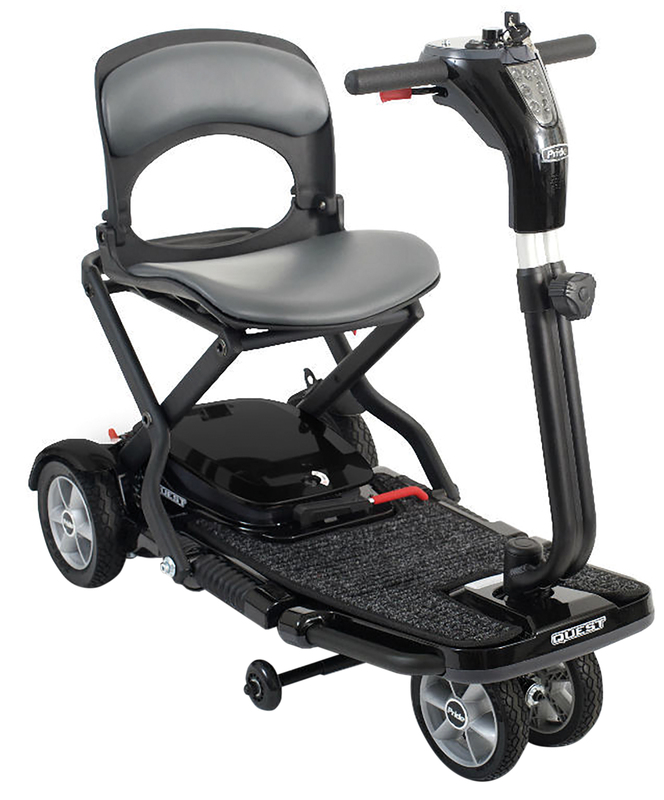 The Pride Quest Folding Scooter is perfect for the active lifestyle. Offering great performance indoors and out at a maximum speed of 4mph. The Quest provides a comfortable ride and a simple easy-fold system. Price excluding VAT.(Incl. VAT £2,994) *VAT Relief available on this product. 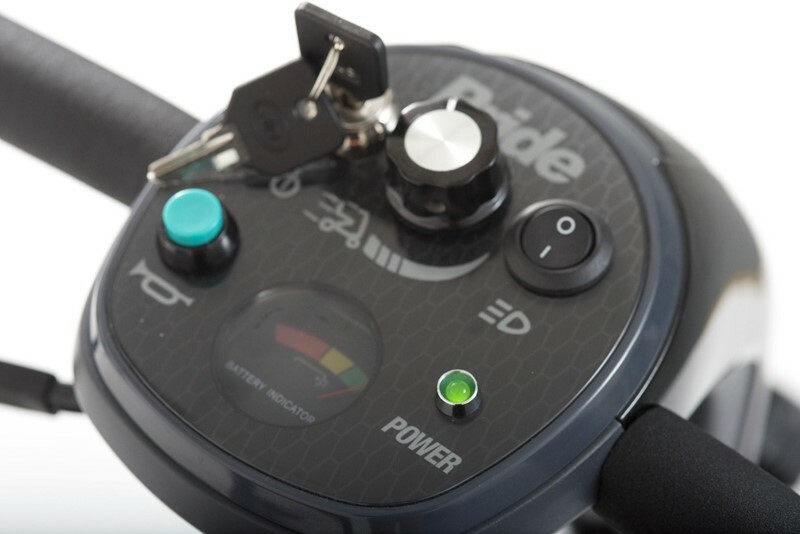 If you’re looking for a lightweight mobility scooter to compliment an on-the-go lifestyle; the Pride Quest is for you. The key feature of the Quest is the folding mechanism. 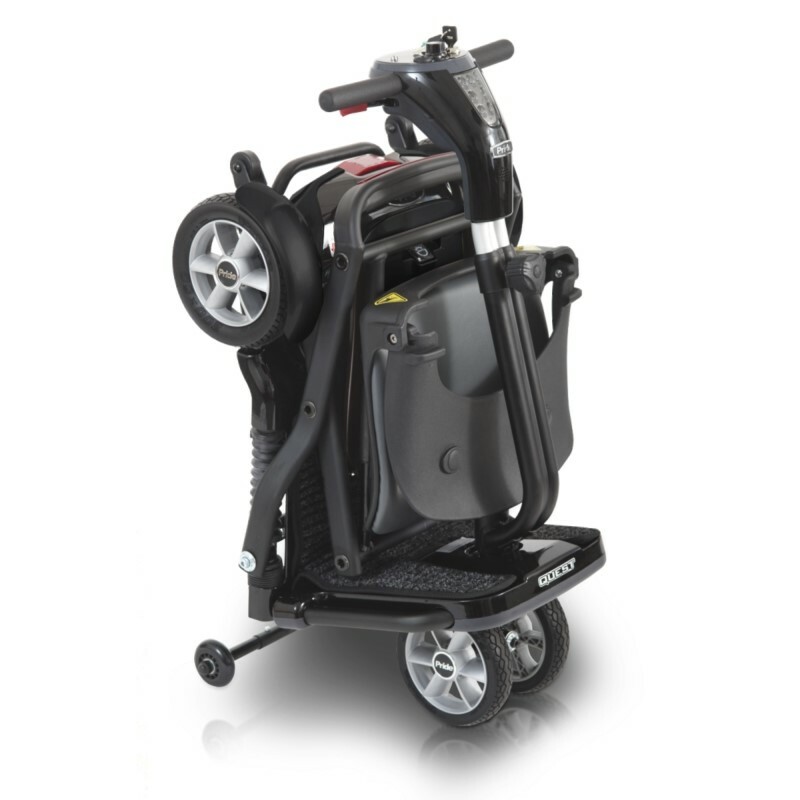 It can be folded within seconds using just one hand, a simple pull of the lever makes this scooter compact and ready for transportation or storage. The total weight of this scooter is 25.6 kg (4 stone) so should be easily lifted. If you do struggle, then it can be wheeled around – even when folded! A lightweight 11.5 Ah lithium-ion battery pack is included as standard which will provide 12.4 miles (20 km) on a full charge. As the battery can be fully removed, it doesn’t matter if the Quest is stored away, you’ll still be able to charge the battery at home. The Quest has some “quirky” design features including a unique tiller with built-in front and rear LED headlights will ensure you can be seen in darker conditions and save battery power. Whether you use the Quest indoor or in a crowded space, the fantastic 32” turning radius will provide the manoeuvrability to navigate objects. The fixed seat and anti-slip carpet in the footwell will keep you comfortable on your journeys. If you’re interested in either a 4 mph or portable mobility scooter, please call our team on 02392 255600 for more information.